idagunji ganapathi temple Idagunji is a small place in Honnavara taluk, Uttar Kannada district, which has the famous Vinayaka temple. The temple is the main attraction at Idagunji, receiving more than 1 million devotees per year. Idagunji, Ganapathi temple is an ancient temple with a history of more than 1500 years, it is a major tourist attraction in the Karavali coast of Karnataka, India. This place has got its own name for its beautiful idol of Lord Ganapathi. The importance of Edakunj kshetra has been mentioned in the Sahyadri khand of the Skandapuran. ‘Eda’ (Wamnadi) means ‘to the left’ and ‘kunj’ means garden. The place thus got its name, as it is located on the left banks of the river Sharawati. This temple is a major piligrim spot which attracts more than 1 million devotees per year. The temple is midway between Gunavanteshwar and Murudeshwar and is 1/2 hr drive from either temple. The temple is quite big. The Ganesha idol is in a standing posture, with extremely short legs, and a depression on the head. The “Dwibhuja Ganapathy” or two handed Ganesha is holding Modaka and Padma (Lotus) in his hands. The idol is of black stone. PANCHAKHADYA is prepared for LORD GANAPATHI it is the special prasada of this temple. 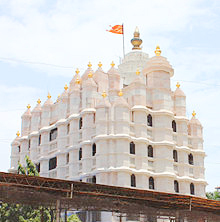 Many devotees (including me) believe that when one is in deep problem all you have to do is pray to Idagunji Ganesha and when Ganesha helps you and your problems are gone, all you have to do is visit the temple and offer a 5 or 10 Rs Panchadaya to the Lord and you will be blessed forever. At Idagunji the Ganesha masks made out of lavancha (sogade beru in Kannada or vetiver in English) make good souvenirs. Raw lavancha ganesh chaturthi dates is also available in plenty. Look out for Ganesha masks caps and other things that are made our of lavancha. It has a pleasant aroma when soaked in water and has medicinal properties. Idagunji is located about 14 kms south east of Honnavar taluk of North Canara District of Karnataka State India. Be it a small child, or an old man, Lord Ganesh here is very beloved with a sweet spiritual smile in his eyes. Idagunji has also got a hall which facilitates religious ceremonies and marriages in this holy shelter. Idagunji has also taken up meal facilities.